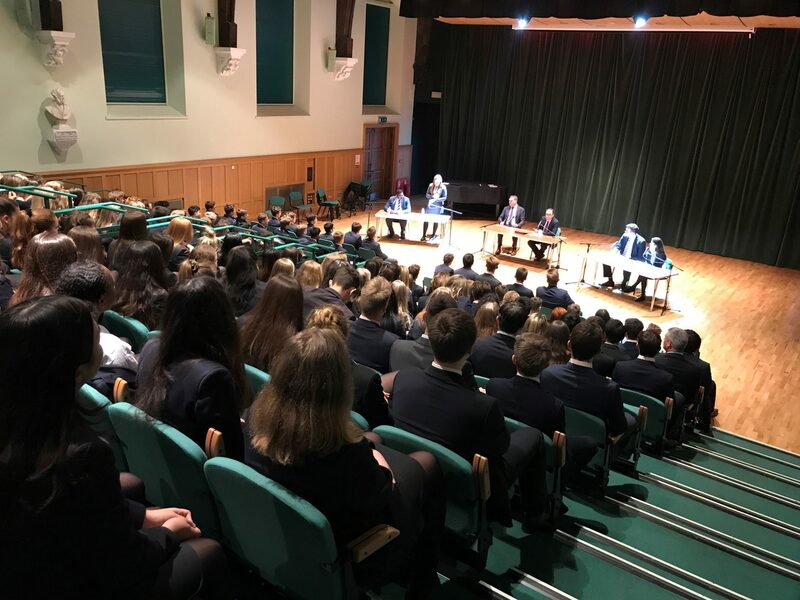 The Philosophy Society and the Curie Society organised the largest inter-society debate yet, filling out Big School. Mackenzie Mully (R) and Guy Peppiatt (F) debated fiercely against Ebube Anyanechi (F) and Henrietta Muller, who proposed that the government should increase spending on the sciences (at the expense of the humanities) in order to safeguard the security of the country. The event was organised by the Philosophy Society, with Guy Peppiatt spearheading advertising and logistics with the assistance of various members of staff and the committees of both societies. All four speakers spoke outstandingly well, with an excellent summation from Mackenzie in particular. There was very little in it; however, the adjudicators handed victory to the Philosophy Society in a difficult decision. The entire event was organised and run entirely by the pupils, and is an excellent example of what members of Epsom College are capable of achieving.